Alto mail is a new email client from AOL which brings a freshness to how you access your email messages. Alto mail offers a beautiful interface which can be appreciated a lot when seen in comparison to other popular email clients like Gmail. The most useful aspect of Alto mail interface is the way information (i.e. emails and information trapped inside your emails) is arranged for viewing. The best feature that is introduced is Stacks. Stacks are like Folders or Labels in Gmail, but implemented in a more intuitive and straightforward way. Some default Stacks are pre-configured like Photos, Attachments and Social Notifications like from Google+. Accessing all your Photos in your mailbox and Attached documents is much more easier in Alto than in any other email client except perhaps in Microsoft Outlook. This also makes easy searching for documents a breeze inside Alto. You can drag and drop a message in the Stacks pane to create a stack of similar messages. Alto also has Tabbed email interface like in Yahoomail. It is a nice touch and works well. Though in our view, Rediffmail like drop down email viewing is more straightforward while checking emails. Still this tabbed approach has its own advantages like checking and working on more than one mail simultaneously. There is not much to complain here. Mail Functions are listed in a left hand side menu like found in Rockmelt browser, Lotus mail client etc. and is a time saver to access different menus quickly. When connected to Gmail it showed Google Calendar and Google Drive in the menu. In People Menu (or Tab) you see people listed in your mail box. 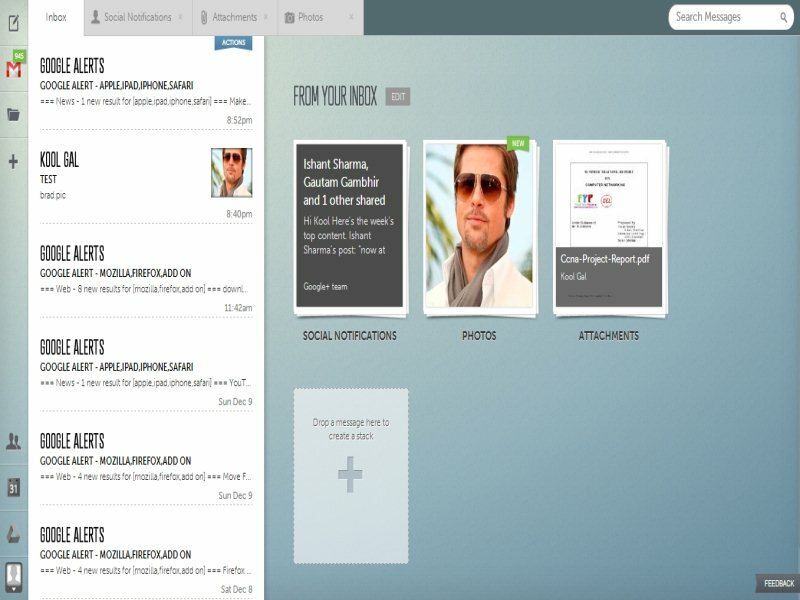 All mails from a person are shown in one pane along with all attachments sent by them. It is a nice presentation and a cool way to view all mail exchanges with your pals in one place. You can also visit there Facebook profile from within Alto mail to check there latest status. 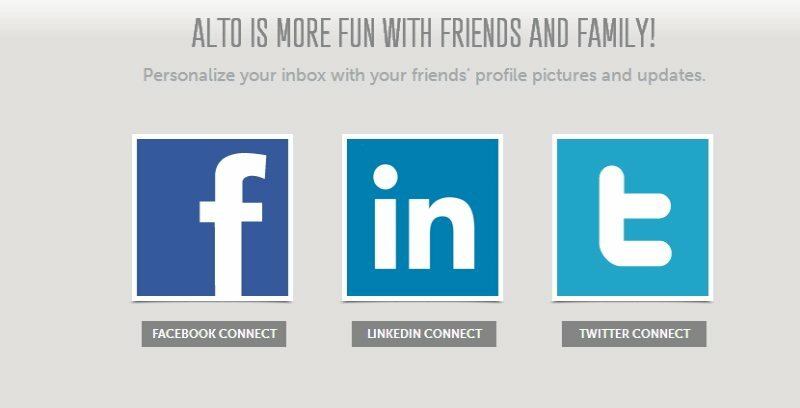 You can also add your Social Networks like Facebook and twitter to Alto mail. Composing a mail in Alto is pretty straightforward. It offers a quick compose mode which can be expanded to a full compose mode. A nifty thing is that your contacts are pulled in from your mail account and address auto-complete is available while sending the message just as in Gmail etc. Alto lets you combine more than one Email accounts and you can check your all mail accounts (presently only AOL, Gmail, Yahoo and Apple iCloud are supported) at once which is a nice feature. Attaching documents is simple and standard. Limited reach as many email services like Microsoft Outlook, Rediffmail, Zoho mail etc. are not supported yet. Send Later feature is not available as is available in Gmail. Undo feature while sending mails is also not available right now. A greater level of integration with other ecosystems is something that you may miss if you heavily use other services like Apps, Calendar, Docs etc. Overall, Alto is a great effort and particularly Stacks is something other Email providers will like to emulate. May be it will evolve over time and give us better integration and App support. But in its present form also, it is a great Email Client. Give it a try and you may well be hooked. Right now Alto is available by invitation only. You can request an invite to Alto mail here.